The 5-star Meliá Bilbao is only a short walk from the Guggenheim Museum and Bellas Artes Museum. You can take a dip in the heated outdoor swimming pool, dine in award-winning Aizian restaurant, sip cocktails in Q Lounge bar, work out in the fitness centre, and stay connected using the free wifi. Stylish rooms have soundproofing, LCD TVs, and ensuite bathrooms with deep soaking tubs. At NH Bilbao Deusto, enjoy a satisfying meal at the restaurant. Buffet breakfasts are available daily from 5 AM to 10:30 AM for a fee. 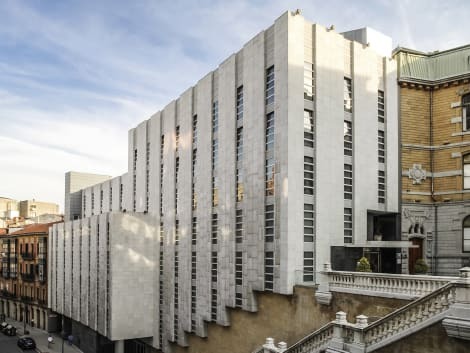 The smart 3-star Ilunion Bilbao is found in the city centre, next to San Mamés Stadium and within walking distance of the iconic Guggenheim Museum. You can try local specialties in the La Kedada Restaurant or tapas and pintxos in the cafeteria, and stay connected with wi-fi throughout the hotel. Furnished in a contemporary style, Ilunion Bilbao’s rooms have free wi-fi, flat-screen TVs with satellite channels, air conditioning and minibars. Fancy a visit to Bilbao? 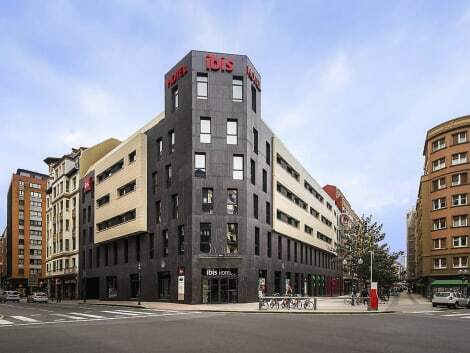 Stay at our ibis Bilbao Centro hotel. This hotel offers very comfortable rooms, fully equipped with air conditioning, climate control, free WIFI throughout the hotel and the best beds to provide maximum comfort during your stay. The hotel also boasts several meeting rooms and a snack bar where you can enjoy a bite to eat. All this for an affordable price and with the best staff at your disposal. Could you ask for anything more? Hotel Ripa is located in Bilbao city centre offering Old Town views and set only 500 metres from Etxebarría Park. Located on a first floor without elevator, each room has a flat-screen TV. Some rooms feature views of the river or the city. The rooms have a private bathroom. Hotel Ripa offers free WiFi . The Ripa Hotel is 3 minutes' walk away from the train station and has perfect connections with metro and tramway. From the Estuary Avenue you can walk to the Congress Palace. Guggenheim Museum Bilbao is 1.2 km from Hotel Ripa, while El Arenal park is 100 metres away. Bilbao Airport is 5 km from the property. Pensión San Mamés is located right next to Athletic Bilbao’s San Mamés Football Stadium and the Termibus Bus Station. Rooms have flat-screen TVs. All accommodation at the San Mamés is equipped with central heating and free WiFi. Each room has a private bathroom with a hairdryer. Guests can make use of a computer and printer in Pensión San Mamés' lounge and TV room. Luggage storage and a 24-hour reception are available. Pensión San Mamés is a 15-minute walk from the Guggenheim Museum and 5 minutes from the International Trade Fair. San Mamés Metro Station is just metres away and offers easy transport around Bilbao. Airport buses stop just opposite the property. 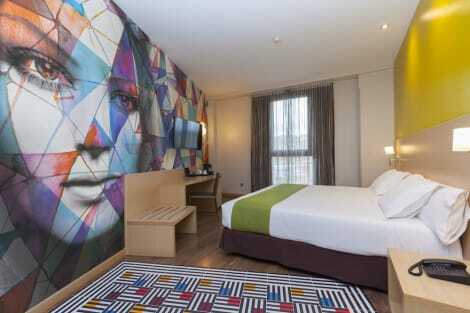 This hotel boasts an excellent location in the historical centre of Bilbao. The property is set amidst one of the largest municipalities of the Basque Country, and is immersed in culture and history. Guests will find themselves just a few steps away from the Arriaga Theatre, Santiago Cathedral and the Guggenheim Museum. The hotel is perfect for travellers who are eager to explore, as well as those who are seeking a relaxing break, away from the bustle of daily life. The guest rooms come well-equipped with modern amenities, offering everything that visitors will need for a comfortable stay. Guests can rent a bicycle at this hotel, and explore the city with ease. Many facilities and services are offered, to ensure a comfortable stay for every type of traveller. Stop by the hotel's restaurant, The Lounge - Le Club, for lunch or dinner. Dining is also available at the coffee shop/café, and 24-hour room service is provided. Quench your thirst with your favorite drink at the bar/lounge. Buffet breakfasts are available daily for a fee. Located next to the Basilica de Begoña, Holiday Inn Bilbao offers stylish air-conditioned rooms with free Wi-Fi and flat-screen satellite TV. Bilbao Old Town and Etxebarria Park are a 15-minute walk away. Decorated in light colours, the spacious rooms include a desk, an electronic safe and a minibar. The modern bathrooms feature toiletries and a hairdryer. A varied breakfast buffet is served daily at the Holiday Inn Bilbao. The Sarasate restaurant serves fresh local and Mediterranean cuisine. There is also a café-bar with a terrace. The famous Guggenheim Museum is a 5-minute drive from the Holiday Inn. Bilbao Exhibition Centre and Bilbao Airport are both within a 15-minute drive. Car hire can be arranged at reception. *Outdoor swimming pool open in summer. *Gym: ¬12 *Spa: ¬20 / VAT and towel included. Bilbao is a vibrant and energetic metropolitan area in sun-drenched northern Spain. Mirroring its scenic position alongside the mountains and the river, it fuses the old and new. The close proximity of Bilbao hotels to major landmarks and transport stations means you'll always feel at the heart of the action. The many hip boutique hotels in city centre locations are a convenient, modern alternative to the traditional Spanish villa. A branch of the famous Guggenheim Museum can be found in Bilbao. The ArcelorMittal Gallery is a permanent exhibition space, part of 11,000 square metres of displays. The Museo Bellas Artes de Bilbao is a short walk from the Guggenheim. The museum is dedicated to the fine arts, and the permanent collection includes more than eight thousand works. The area is extremely well connected for public transport, giving you more chance to explore Spain. Bilbao Abando train station is known locally as Estación del Norte – ‘North Station'. It's the main terminal in the region, with links to Barcelona, Madrid and Málaga. Bilbao's reputation for delicious cuisine is widely known. It's part of the Basque region, and as such you can easily find pintxos – Basque tapas – to nibble on. A Spanish take on ‘surf and turf' is also likely to be on the menu. Wash your snacks down with txakoli wine – for a lighter drink, try kalimotxo, red wine mixed with cola. A zurito is a small beer, and you'll find cocktails and spirits at Bilbao's many bars and nightclubs. The town feels obsessed with food, shown in the sheer number of eateries. Along with changing seasonal dishes and delicacies, the resulting choice means you can eat differently every day. If you only visit one shop during your holiday, head to El Corte Inglés. This massive department store has souvenirs, essentials, fashion and groceries under one roof. Luxury and designer-brand stores line the Plaza Moyúa. Close by, there are some familiar names including Clarks and H&M. The area south of the plaza has a number of adult stores, so keeping an eye on the kids is especially important. La Ribera Market, in the old town, is in the book of Guinness World Records as the largest indoor market in Europe. The record's based on the impressive number of stores and outlets.